Take Your Teddy Bear To Work Day! Wow! 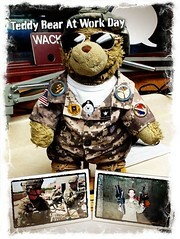 What an exciting time I had yesterday as we celebrated Take Your Teddy Bear To Work Day in a big way! I went to work with my human-owners Dad. It’s always a fun time at the radio station and everyone is so nice there too! I would have loved to go to work with my human-owner SPC Benjamin Jeffrey, but of course since he’s in Afghanistan, I couldn’t make it there. I am glad he has “Stealth Sarge” with him though. I know Stealth is on the job and doing a great job of keeping Ben company while he’s deployed. Even though I couldn’t go to work with my human-owner, I am happy to have pictures of him at his “work place”. I decided to honor my human-owner by posing with two of my favorite pictures of him. It’s Monday and it’s time for our Military Child of the Week Salute. 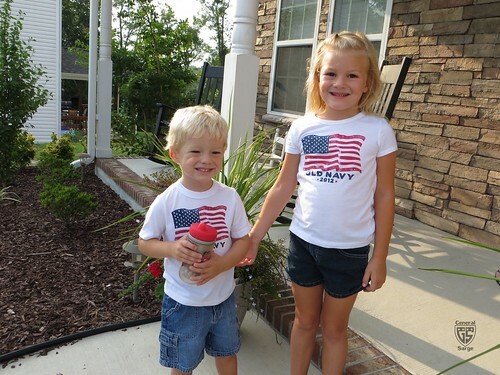 Today we’re saluting two great kids who’s Daddy is currently serving in Afghanistan with the U.S. Marines. It’s my honor and privilege to introduce to you today Kendall and Gradyn Hackworth. Their Daddy – Chief Warrant Officer 2 Brandon Hackworth based out of Camp Lejeune, NC – deployed to Afghanistan in April of this year. “Kendall is 5 years old and she’s really grown up while her Daddy is away. In May she graduated from pre-school, finished the spring soccer season and performed in the spring dance recital. In July she turned 5 and in August she started kindergarten. Her Daddy has had to miss all of these important events in her life and she misses him dearly”. Kendall’s Mommy also told us here at General Sarge HQ that “she’s an awesome big sister to her brother and helps me take care of him”!